New log house in a beautiful setting with a brook running through the property. Right across from the Courtyard by Marriott Hotel with the entrance directly from the main road but still far enough not to hear the traffic. This spacious 4 bedrooms plus a loft and 2 bathrooms house can comfortably accommodate 10-12 people. It has a roomy loft upstairs with a twin size sofa bed, and 4 nicely furnished bedrooms (Main Floor: Bedroom 1 with one king bed, Bedroom 2 with one queen bed, Full bathroom, 2nd Floor: Bedroom 3 with one bunk bed (twin-over-twin) and one double bed, Bedroom 4 with one bunk bed (twin-over-double), Full bathroom. In summary, the 4 bedrooms can comfortably accomodate 11 people and the additional pull-out sofa can accomodate 1 more guest. This is a perfect location for the nature lovers in a secluded and quiet spot, but still you are in within walking distance (maybe some 20 minutes walk or 2 minutes drive) of the Main Street. Our experience in the log home was exceptional. The temperature controls in each room made all of us “temperature intolerant” people very happy! The weather did not cooperate. Our sleigh ride didn’t happen, and it rained A LOT! Luckily, the log home could accommodate a group of 8 adults playing games around the large table. 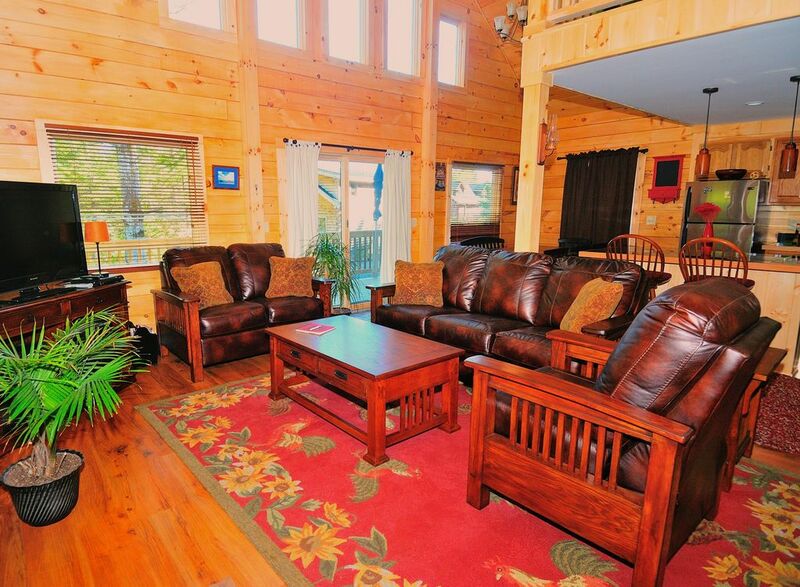 Ninja cabin is located in the perfect spot for a fun-filled vacation in Lake Placid. It is so close to EVERYTHING you will want to do; but, it is tucked away and still provides a cozy cabin experience. Sam (the owner) is so helpful and responds quickly to all emails. We enjoyed our stay at the house. This is an excellent location if you need to be close to the horse grounds, easy access to 73 and 86 and trailheads towards Keene. Well equipped kitchen, nice deck, washer and dryer were key. Ample parking for our crew, which included 4 vehicles! Keep in mind there is no central air or AC units, so the only drawback was a warm first night for the upstairs. The cabin was perfect for the family of 10 to stay as a group but we never felt cramped and although its very close the village which has all of the in town advantages it is tucked away in a spot that would surprise one for its privacy. We would defiantly stay again ! We had a great time staying here with our wedding party. The cabin has a great layout and location. Sam, the owner, was very quick to respond to our questions and was super accommodating. We would definitely stay here again. The property was perfect for our family. Very spacious and the deck was great! Nightly Rate: $375 Weekly Rate: $2400 Daily rentals - $150 cleaning fee. Minimum 3 nights Weekly rates - No cleaning fee. *** Rates based on up to 10 people occupancy. Additional person $25 per night *** NOTE: Rates are higher during holidays (Xmas, New Year, President's Day) and Special Events.